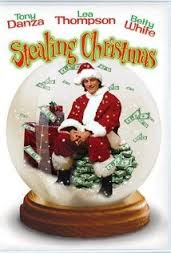 Stealing Christmas (2003) Rated TV-PG | What to Watch. When Jake’s Christmas robbery plan gets disrupted, he escapes in a Santa suit to a small town. There he plans his next robbery while working as Santa. Starring Tony Danza, Lea Thompson, Angela Goethals, Betty White. I enjoyed this Christmas heist film. Danza plays Jake, the mastermind behind the robberies, who has a change of heart when he meets the good people of Evergreen, the small town he escapes to. It’s a redemptive story of second chances, of forgiveness instead of retribution. Danza and Thompson are wonderful in their roles; you can’t help but root for them. This film is worth a watch. This entry was posted in 2003, Christmas Films, comedy, Crime, Drama, films, Movie reviews, movies, Rated TV-PG, reviews, Romance and tagged Angela Goethals, betty white, characters, chrismtas film, Christmas, christmas films, christmas movies, consequences, film, film reviews, films, heart, heist, Lea Thompson, love, movie, movie reviews, movies, people, redemption, robbery, Santa, santa suit, small town, Stealing Christmas, story, Tony Danza, trailer, worth. Bookmark the permalink.